Background: Mastocytosis is characterized by the accumulation of aberrant mast cells (MC). Patients suffering from mastocytosis suffer from a wide range of symptoms due to increased levels of MC mediators. It would therefore be of great benefit to inhibit MC mediator release. However, to date there are few drugs available that are known to effectively lower MC mediator levels. The evidence for the involvement of the janus kinase 2 (JAK2)—signal transducer and activation of transcription 5 (STAT5) signalling pathway in MC activation is slowly accumulating. Interference with the JAK2-STAT5 pathway might inhibit MC mediator release. Ruxolitinib, a JAK1/JAK2 inhibitor, indeed decreases symptoms like pruritus and fatigue in patients with myeloproliferative neoplasms. Yet, detailed studies on how ruxolitinib affects human mast cell activity are lacking. 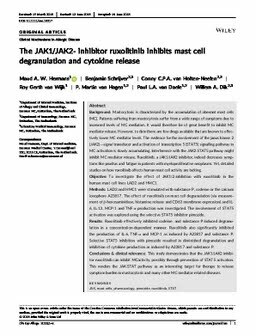 Objective: To investigate the effect of JAK1/2-inhibition with ruxolitinib in the human mast cell lines LAD2 and HMC1. Methods: LAD2 and HMC1 were stimulated with substance P, codeine or the calcium ionophore A23817. The effect of ruxolitinib on mast cell degranulation (via measurement of β-hexosaminidase, histamine release and CD63 membrane expression) and IL-6, IL-13, MCP-1 and TNF-α production was investigated. The involvement of STAT5 activation was explored using the selective STAT5 inhibitor pimozide. Results: Ruxolitinib effectively inhibited codeine- and substance P-induced degranulation in a concentration-dependent manner. Ruxolitinib also significantly inhibited the production of IL-6, TNF-α and MCP-1 as induced by A23817 and substance P. Selective STAT5 inhibition with pimozide resulted in diminished degranulation and inhibition of cytokine production as induced by A23817 and substance P. Conclusions & clinical relevance: This study demonstrates that the JAK1/JAK2 inhibitor ruxolitinib can inhibit MCactivity, possibly through prevention of STAT5 activation. This renders the JAK-STAT pathway as an interesting target for therapy to release symptom burden in mastocytosis and many other MC mediator-related diseases.